Motorcar racing usually brings to mind titles like Formula One or NASCAR, but within these well-known championships, are a selection of individual races, that have made this international sport what it is today. Many of the most famous races currently running were established towards the end of the 1900s, such as the Daytona 500 (1959) or Bathurst 1000 (1960). However, there are several races, among the most widely followed, that carried the sport throughout the twentieth century, and continue to break new ground to this day. These are what are known as the Triple Crown of Motorsport. The Indianapolis 500 is an open-wheel race that takes place over the Memorial Day weekend in the United States each year. First launched in 1911, the competition consists of 200 laps around the Indianapolis Motor Speedway, and forms part of the Verizon IndyCar Series. 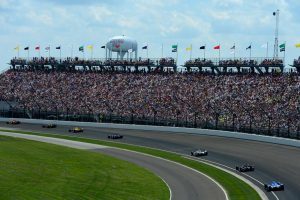 Not only is the Indy 500 one of the oldest races still in practice, but it has also been called “the fastest racing series in America”. The 24 Hours of Le Mans first originated in 1923 and since then has been held in June every year since. The duration of this race is 24 hours, making it a test of perseverance and endurance, which are both essential to complete the race, let alone win it. It takes place on the Circuit de la Sarthe and totals a distance of 5005 kilometres. Because of the length of the race, up to three drivers are allowed for each vehicle, providing an opportunity for rest during the 24 hours. Since 1929, albeit slightly later than the races mentioned above, the Monaco Grand Prix has been taking place yearly on the quaint, winding streets of the city of Monaco. The competition consists of 78 laps and a total driving distance of just over 260 kilometres. As a Formula One event, the race has not necessarily grown regarding design and layout since its origins. However, its rules regarding car requirements change each year. It has also undoubtedly grown in popularity and remains an industry classic, carrying the essence of this sporting tradition to global audiences.